Inscribed stone (stele) Palas is located in the village Pasemah Palas, Palas subdistrict, South Lampung. 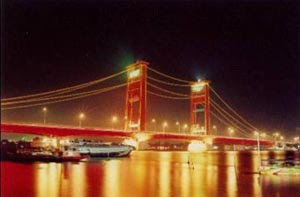 As we drove toward the city of Bandar Lampung Bakauheni, about 20 km from the port of Bakauheni MTA will find the intersection of the center lane Palas and Lampung. We, too, turn right and go as far as 10 miles to arrive at the historical tourist sites Palas. Inscribed stone inscriptions Pasemah Palas is a kingdom of Srivijaya relics discovered in 1957 in Palas Pasemah, Kalianda area, Lampung. Consists of 13 rows, but row-1 through the 3rd missing. The contents of the inscription originally discussed by Prof.. Dr. Buchari in the article: Buchari, "An Old Inscription of Srivijaya Malay at Palas Pasemah (South Lampung)", Pre Srivijaya Research Seminar, Center for Archeological Research and National Heritage, Jakarta, 1979. Need to ask a lot of people along the village road Palas, so as not to miss when looking for the location. This inscription is as less promoted, but the site where the inscription was well maintained Palas Village Road was a smooth asphalt that divides the village with beautiful scenery and exotic. Palas inscribed stone inscription is one of the stele inscriptions persumapahan Sriwijaya. "Persumpahan inscriptions", ie inscriptions containing curses and threats for those who oppose or do not want to devote to the king of Srivijaya. The term "parsumpahan" is derived from the Srivijaya king himself, as contained in such inscriptions. Srivijaya inscription inscription belonging persumpahan are inscriptions Stone Lake, Town Chalk, Coral lust, and Palas Pasemah. Perhaps in the future will still be found inscriptions persumpahan others. 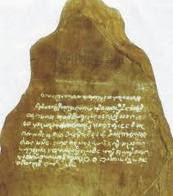 Inscription TELAGA STONE found in 1935 in Stone Lake, Sabukingking 2 Ilir, Palembang. Consisting of 28 lines, the state emblem decorated in the form of a dragon with seven heads Srivijaya. Now stored at the Museum Center, Jakarta, with a number D.155. The inscription was first published by Prof.. Dr. Johannes de Casparis Gijsbertus in the book: J.G. de Casparis, Indonesia Inscription II: Selected inscriptions from the 7th to the 9th Century AD, the Department of Antiquities of the Republic of Indonesia, The New, Bandung, 1956. CITY CHALK inscription discovered in 1892 in the City Limestone, Jetty Mundo, the west coast of the island of Bangka. Consisting of 10 lines, and numbered at the Museum Center D.90. The inscription was first discussed by Prof.. Dr. Hendrik Kern in the article: H. Kern, "Van De Inscriptie Limestone City", Bijdragen Koninklijk Instituut (BKI), deel 67, 1913. CORAL inscriptions found passion in 1904 at Coral area lust, Edinburgh. Consists of 16 rows, first transcribed by prof. Dr. Johannes Nicholaas Krom in the article: N.J. Krom, "Van De Coral Inscriptie Brahi", Tijdschrift Bataviaasch Genootschap (TBG), deel 59, 1920. Palas Pasemah inscriptions found in 1957 in Palas Pasemah, Kalianda area, Lampung. Consists of 13 rows, but row-1 through the 3rd missing. The contents of the inscription originally discussed by Prof.. Dr. Buchari in the article: Buchari, "An Old Inscription of Srivijaya Malay at Palas Pasemah (South Lampung)", Pre Srivijaya Research Seminar, Center for Archeological Research and National Heritage, Jakarta, 1979. Of the four pieces persumpahan inscription above, only one of which dates to the year, the City Kapur inscription carved in the year 608 Saka (686 AD). Therefore the content of the inscriptions are almost the same, then it is very likely all persumpahan inscriptions were carved in the same year. Swasti CRI. 606 çakawarsatita dim dwitiya çuklapaksa quarterly caitra, there tatkalanya parlak this çriksetra niparwuat, Parwan Dapunta Cri jayanaça hyang. "Happy, successful. Saka year 606 passed the second day of the month paroterang Caitra (March 23 = 684), it's time to park Sriksetra this done, the statutes Dapunta Hyang Sri Jayanasa. " Here we get the full name of the king of Srivijaya: Dapunta Hyang Sri Jayanasa. If between the years 684 and 686 there is no change of the king, then that's what he would issue a persumpahan inscriptions. 608 çakawarsatita dim pratipada çuklapaksa waiçakha quarterly, which tatkalanya nipahat mangmang this oath, in which wala çriwijaya welanya kaliwat manapik the Grounds java tida çriwijaya bhakti ka. "Saka year 608 passed the first day of the month paroterang Waisaka (February 28 = 686), time to spell this oath carved, when the Srivijaya elapse troops invaded Java land that is not devoted to the Srivijaya." kadaci that urang therein Grounds this kadatuan ajnyanya parawis, drohaka wangun, samawuddhi drohaka opponent, mangujari drohaka, niujari drohaka, know dim drohaka, tida marpadah yes, yes tida bhakti for all, no yes I tatwarjawa on view at the nigalarku Sanyasa datua, dhawa wuatnya urang Inan, niwunuh oath yes, yes tapik nisuruh mulang parwandan çriwijaya datu, Talu muah view gotrasantananya yes. "Wherever there are people in this kingdom's territory entirely, build iniquity (rebellion), cooperation with the mutineers, mutineers, rebuke, reprimand mutineers, in agreement with the mutineers, he did not obey, he is not filial, he was not faithful to me by the leaders of the region that kugelari , wicked deeds, he will be killed oath, he would be told to attacking on the orders of the king Srivijaya, will be crushed him with all his family. " Read the contents of the inscriptions persumpahan above, it can be imagined that Dapunta Hyang is a brilliant politician. Before he launched an expansion into foreign territory, domestic stability is noticed. Surely persumpahan inscriptions were placed on the countries that allow the emergence of insurgency. Until now persumpahan inscriptions recently discovered in Palembang, Bangka, Jambi and Lampung. This shows that the power of Srivijaya in the year 686 had at least cover these areas. The existence of persumpahan Lake Stone inscriptions in Palembang cause Prof. Dr. Sukmono refused locations in the capital of Palembang Srivijaya. In his "On Localization of Srivijaya", Report of the First National Congress of Sciences, Volume 5, Assembly Sciences Indonesia, Djakarta, 1958, Sukmono ask the following questions (adapted to EYD 1972): "If indeed the capital of Palembang Srivijaya, could make sense that curses in the form of terrible threats is actually enshrined in the capital? Could it be the capital of its own citizens thus threatened by the king? " Prof. question. Sukmono this needs to be answered with another question: "Does not make sense that rebellion may occur in the capital? Is not that time the capital is empty without power, because the army is being mobilized to invade Java Land? " The revolt in the capital are even more dangerous than a rebellion in the lands of subordinates, as they may be done by people close to Dapunta Hyang and directly related to the central government. Dapunta Hyang certainly not ignore the existence of such a coup of the "grand coalition" of high officials of the kingdom. That is why he sees the need to give warnings and threats in the capital of Srivijaya. In the history many of us find that a ruler was stabbed by the enemy in the blanket, when the rulers were busy thinking about the problem of "foreign". This happens, for instance, the king of the Kingdom Singhasari Kertanagara the 13th century. 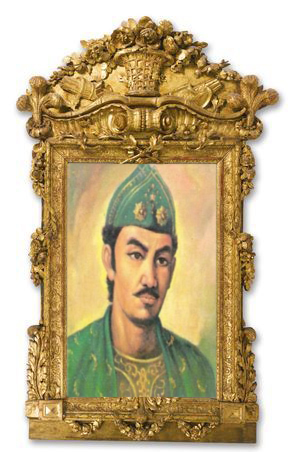 Kertanagara Singhasari send massive troops into Malay (Edinburgh) in anticipation of a possible attack from Mongol armies of China to the archipelago, but he was negligent in Singhasari own attention to security. Vassals, Jayakatwang of Kadiri, to exploit the situation for the overthrow of the throne Kertanagara. This is the consequence if a ruler to ignore security in the capital. You wanyakmamu, rajaputra, prostara, bhupati, senapati, Nayaka, pratyaya, hajipratyaya, dandanayaka, .... murddhaka, tuhaan watakwuruh, addhyaksi nijawarna, wasikarana, kumaramatya, çatabatha, adhikarana, karmma ...., kayastha, sthapaka, puhawang , waniyaga, pratisara, you Marsi pilgrimage, hajj hulun, wanyakmamu urang, niwunuh oath of mangmang you kadaci tida bhakti in me. "You all: the son of kings, ministers, regents, commander, princes, officials, court officials, judges, .... murddhaka, chairman of the workers, supervisors commoners, weapons experts, the board of the youth, sportsmen, construction workers, karmma ... , clerk, architect, skippers, merchants, captains, ye servants palace, the palace, all men, were killed when the oath of spells you do not worship me. " Positions listed above only the inscription Stone Lake, and not mentioned or mentioned in the inscriptions persumpahan others. Therefore it is the positions of high office in a government, of course, its officials living in the capital. By itself the inscription must be installed in an environment inhabited by the officials. On that basis it can be concluded that the center of Srivijaya Kingdom government is very likely located in the vicinity of Stone Lake, Palembang.